What is Online Conveyancing tracking? At KRG Conveyancing, we are dedicated to keeping you informed regarding the progress of your Conveyancing matter. For this reason, we have developed a secure interactive Online Tracking service that allows you to track you file over the internet, from anywhere in the world. For many of our clients, this is the best way for them to stay in touch with the progress of their matter. As a KRG client, you will be provided with a personal username and password, allowing you access to the secure and confidential client area of our website. This free Tracking service allows you to log on to this website at any time of the day and see an up to date snapshot of your file. If you ever forget or misplace your password, please contact us and we will assist you. We make it simple for you to find out how your conveyancing matter is progressing with our unique Online Tracking System. As a KRG client, you will be issued with a username and password, which will allow you to easily login to our Online Tracking System. Once you have logged in you will be able to view a live report which shows your matter’s progress and any comments your conveyancer has. Below is a sample Purchase Report. Your report will list your conveyancer’s contact details, your client information and matter details. It will show the status of your matter, what steps are outstanding and those that have been completed. 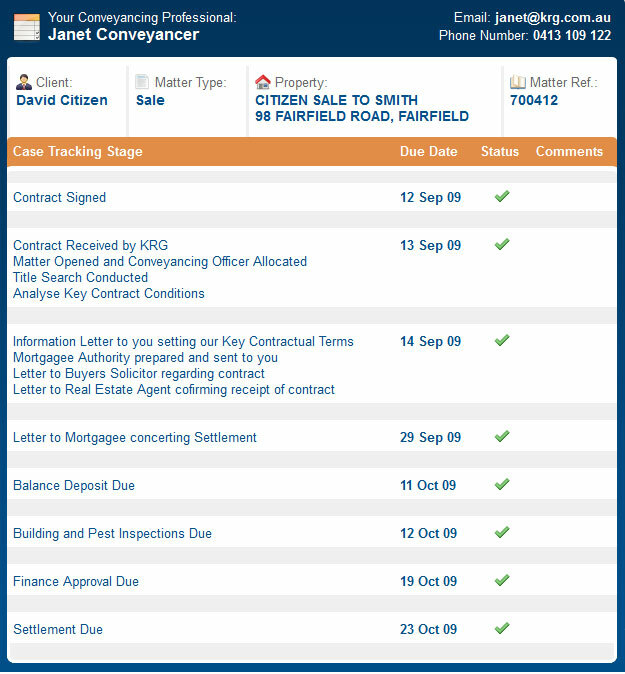 This online conveyancing tracking report is live, meaning when a step has been finalised in your conveyancing matter, it will automatically show in your Tracking Report. This allows you to understand your position on a current basis, and what to expect during your conveyancing. We also send you SMS’s and emails to keep you updated at all times, 24/7!